We were incredibly lucky to be able to move into the neighbourhood where the laneway is being built. Thank goodness for basement suites, as there are very, very few apartment buildings available around here. The ones that we could find are subsidized housing, and those are nearly impossible to get into, especially for short-term rentals. But here we are and we are very happy with the area. For one thing, transit is a breeze. We are very close to the Skytrain, and will be even closer when we move to the laneway. We can get downtown, to our gym, to shopping in Burnaby, and to parks and recreation quickly and easily. The Broadway corridor is right there, with the express buses running during rush hours to whisk me to and from work. We use the car even less here than we did at our old residence. Shopping is also great. I miss my London Drugs right down the street, but there are plenty available a short Skytrain ride away. We have a Superstore within easy walking distance, as well as a small shopping centre with a Price Smart, a Pet Smart, Canadian Tire, Mark’s Work Wearhouse, and a Starbucks (*whew*). There’s a WalMart right down the street, too. On an exploratory walk around the neighbourhood last weekend, we found several small parks close by. Plus a possible pizza place. We also have walked over the Commercial Drive on the Central Valley Greenway, which DH has explored on his bike. But all this was something we expected, because we thought quite a bit about the neighbourhood before we agreed to move here, checked out the Walk Score, etc. and so we knew what to expect…..or so we thought. What were we not expecting? Garbage collection. I lived in a condo for about 30 years, the years of Garbage Collection Reformation. In a condo, garbage was something you took out, put in the giant bin, and it magically disappeared. 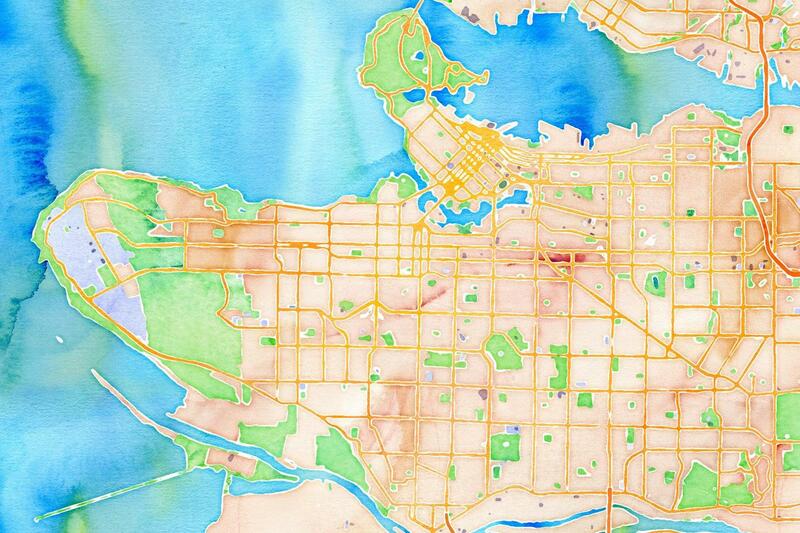 We had visited friends’ homes and seen coloured maps of Vancouver on the sides of their fridges, but we’d never really considered what they were for. I don’t know if we suspected that all our friends had identical taste in fridge decor, but we just never thought about it. But now we do! Because my friend, you LIVE AND DIE by the date of your garbage collection. Every two weeks that truck trundles down that lane and if you don’t have your garbage out where they can grab it, it’s like Santa, that truck is not going to come back until its appointed time. Luckily every single week a truck comes by for recycling. And if you don’t think that’s a motivation to recycle everything you possibly can, you have never tried to fit four week’s garbage into a two-week bin. Now there is something even newer than regular recycling, which is composting. Vancouver now takes your table scraps and coffee grinds and composts them. It’s a great idea! And it makes that every-other-week garbage collection quite doable. In fact it’s such a good idea that Mayor Bloomberg is doing it in New York City. Another advantage that I never expected started out as an inconvenience. I know I’ve mentioned that the laneway is being built into a slope. I don’t think I’ve told you that the slope is actually a big, honking hill that runs from a couple of streets above ours right down to the Grandview Highway where all the stores are. Just to get to the Skytrain from the laneway means climbing down, and of course back up, a significant grade. I thought this would be a pain, but it has turned into a blessing. The first few times I charged up that hill to catch the 7:38 99 bus, I swear I thought I would pass out. There were little red dots dancing in front of my eyes. But just a couple of weeks has given me much more stamina — it’s great exercise! Who knew! Oh, the people at Life Edited knew. They point out in this article that cities where exercise is built right in have healthier citizens. Posted in Housing, Laneway House, Uncategorized and tagged Lane Home, Lane house, Laneway House, Neighbourhoods, Vancouver. Bookmark the permalink.